ysabetwordsmith | Poem: "Under Any Other Scenario"
Poem: "Under Any Other Scenario"
Based on an audience poll, this is the free epic for the June 2, 2015 Poetry Fishbowl meeting its $200 goal. It is spillover from the May 5, 2015 Poetry Fishbowl. It was inspired by a prompt from siliconshaman. It also fills the "My Guardian Angel" square in my 7-30-14 card for the genprompt_bingo fest. This poem belongs to the Polychrome Heroics series, and it's a direct sequel to "Hercules and the Lions." to reassure themselves of each other's presence. as he took pictures of the elephant family. he had expanded to animals with superpowers. designed to protect and transport rangers on guard. to help protect Hercules and his family. to animals with any kind of superpowers. but the rest of his herdmates weren't. something more than ivory on the hoof. and mudfights and lazy walks at sunset. the elephants made him a target. with a bullet through his chest near the shoulder. rangers were reluctant to turn on wildlife. "Go, run!" Chikondi shouted to Hercules. "Hide and seek, just like we practiced!" in case something like this happened. toward a dark line of trees in the distance. the elephants might lose the poachers. was Invulnerable; he was still just a baby. and silent as the heat waves it resembled. it moved with ponderous strides. to land beside him, taking up a guard stance. here he might be able to help. "I will cover you both. Tend the man,"
Hatalimi said without looking at Chikondi. His attention was all for the poachers. a target of himself for their sake. "I have some first aid training as a tour guide,"
real medical attention, as soon as possible." the pain, perhaps some other cause. "I'll call in the angels," Hatalimi promised. giant vultures, fast and agile in the sky. miles away from their location. "Meanwhile, I'll do what I can," Chikondi said. have been a great deal worse. the bullet had probably nicked a lung. ready to defend them if necessary. deliver a punishing force ... if it fired at all. of the Jumbe's sonic blast. like so many captured antelope. to draw a knife and saw at the rope. her powerful thigh muscles rippling. hung limp in the heavy ropes. crashed into a tree near a waterhole. The elephants are unharmed, just agitated,"
Haazita called down to his twin brother. "Still alive, but badly wounded," said Hatalimi. I have already called for medevac." stretched against the blue sky, pointing. else where to look for the incoming aircraft. beside the injured photographer and his guards. swung the emergency kit off her back. showed boldly against her black skin. as she knelt to check on Ellis. "Single gunshot wound through the left shoulder,"
had happened and what he had done for Ellis. the casualty into the support cradle." a real hospital where they could repair the damage. The Malaika took off, soon dwindling to a speck again. at the poachers who had caused so much misery. The four men still hung down the sides of the Jumbe. poaching was just business as usual. convicted for what they had done. any African mine tended toward the horrible. "Thank you for saving us all,"
Chikondi said to the rangers. Hatalimi clapped him on the back. that you helped to save the photographer,"
and thus make it easier to get funding." the park staff and wildlife would all be safer. and found that the equipment was still intact. of applying first aid to a gunshot wound. Hercules -- He is an African elephant about one year old as of spring 2014. After surviving a lion attack, he became friends with a local tour guide, Chikondi Kanga, who named him after a legendary Greek hero. Hercules refers to Chikondi as "Auntie" because only female elephants raise the calves. Their friendship led to an exploration of art. Hercules has a strong sense of African culture and takes pride in his homeland. When offered a choice of different colors for painting, he consisently chooses the deep bold tones popular with many neighboring humans -- crimson, hunter green, gold, lapis blue, violet, etc. Origin: In spring of 2014, he was attacked by a pride of fourteen lionesses, and his superpowers manifested to save him. The lionesses were very confused. Motivation: To learn and to grow. Chikondi Kanga -- He has rich brown skin, brown eyes, and short nappy black hair. He speaks Bemba, English, French, German, Portuguese, and Tonga. He first became an amateur guide as a member of the wildlife conservation club at school, and he got a degree in Environmental Studies. He can barely get by in urban areas, and much prefers the wilderness. Currently Chikondi works as a tour guide at the Chinzombo Camp of the South Luangwa National Park in Zambia. There he made friends with a young elephant, Hercules, who has superpowers. Ellis Lambert -- He has fair skin, brown eyes, and short brown hair with scruffy stubble on his face. He is British, but works most of the time in Africa as a wildlife photographer. His steady hands and good grasp of equations make him a talented shooter. Ellis has recently expanded his interest from ordinary animals to superpowered ones. His curiosity sends him poking into everything, but he easily loses awareness of what's going on around him. Plus his sense of ethics puts him at odds with poachers, which has gotten him into trouble more than once. 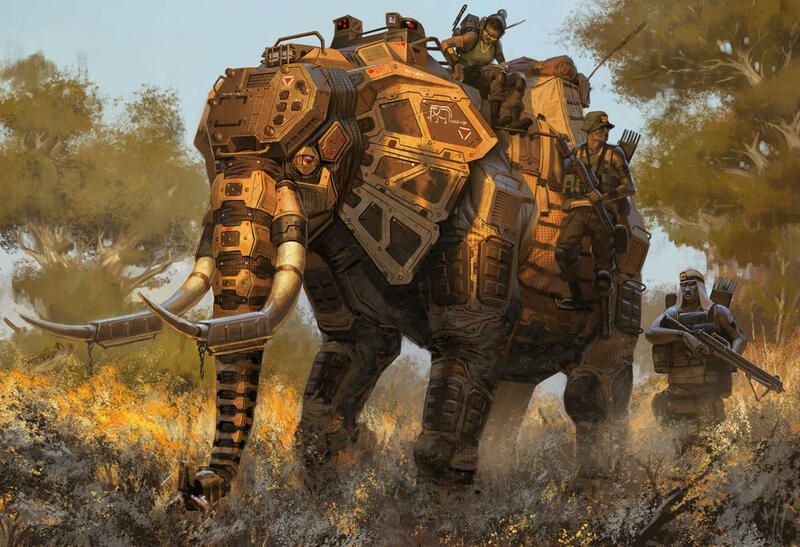 Jumbe-class Super-gizmotronic Elephant -- This construct can carry a crew of two to five rangers. This one has a crew of three rangers, two men and a woman. A Jumbe is heavy and cumbersome; it cannot sneak, or travel over unstable footing such as mud or rubble. It excels at the same kind of territory frequented by live elephants: African savannah and plains. In those areas it makes a formidable vehicle for rangers or soldiers. Haazita Cawuke -- He has medium brown skin, brown eyes, and short nappy black hair. He is the older of fraternal twins; his brother Hatalimi is the younger. (In the picture, Haazita is standing in the back, slimmer and more graceful.) They are Vahlengwe, the original and still the largest of all Tsonga tribes. The twins work at the Chinzombo Camp of the South Luangwa National Park in Zambia. Haazita relies on speed and foresight to get ahead of the enemy. He leads a trio of rangers from the back of a Jumbe-class super-gizmotronic elephant. His prodigious appetite means he never gets enough to eat. Hatalimi Cawuke -- He has medium brown skin, brown eyes, and short nappy black hair. He is the younger of fraternal twins; his brother Haazita is the older. (In the picture, Hatalimi is standing in the front and his muscles show more.) They are Vahlengwe, the original and still the largest of all Tsonga tribes. The twins work at the Chinzombo Camp of the South Luangwa National Park in Zambia. Hatalimi depends on his toughness to withstand attacks. He rides with his brother and their partner Shumpa Valoyi on the back of a Jumbe-class super-gizmotronic elephant. He carries a force rifle, but prefers his crossbow. Hatalimi is not very good with mechanical or electrical things, and often says, "I'm a ranger, not a gizmologist." 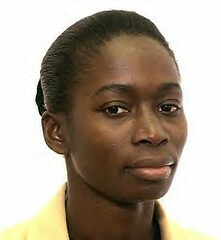 Shumpa Valoyi -- She has dark brown skin, brown eyes, and nappy black hair just long enough to pull back into a bun. She comes from Copi heritage. Shumpa works at the Chinzombo Camp of the South Luangwa National Park in Zambia. Shumpa is fierce and effective in combat. She rides with the Cawuke twins on the back of a Jumbe-class super-gizmotronic elephant. Her harsh personality inclines her to shoot first and ask questions later. Malaika-class Super-gizmotronic Vulture -- The Guardian Angels are African medics who fly aircraft that resemble giant birds. The Malaika-class super-gizmotronic vulture can carry one medic, one casualty, and basic emergency supplies. They are build for speed and agility rather than strength, so lift and cargo capacities are minor. However, the soaring mode while on call gives them amazing fuel efficiency for a super-gizmo. Levitation makes them more effective than ordinary flight. Without armor, they rely on medical neutrality to keep people from shooting them down. Usually it works, but poachers are notorious for disrespecting that. Lusungu Henhla -- She has dark brown skin, brown eyes, and a thick ruff of nappy black hair often held back with a headband. She belongs to the Bila people. Lusungu works at the Chinzombo Camp of the South Luangwa National Park in Zambia. 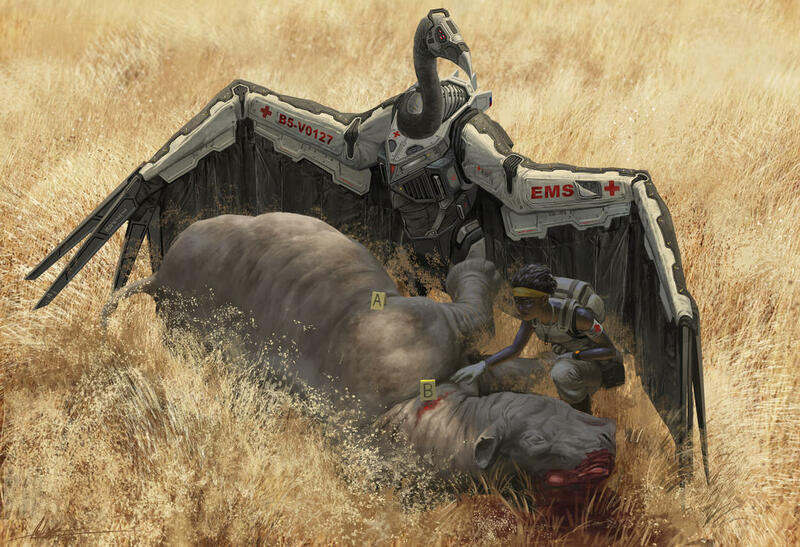 She flies a Malaika-class super-gizmotronic vulture to provide emergency medical care throughout the park. Lusungu is good at talking her way out of trouble. She hates staying in one place for very long, though. Mechanical elephants are real, although clunky in local-America; this one is made from recycled parts. Watch it walking. Poaching poses major problems throughout much of Africa. Zambia has seen falling and rising rates. There are collective and individual ways to fight poaching. Gunshot wounds can do a lot of damage. The human chest contains vital organs, and even a peripheral injury can be life-threatening. First aid typically requires action to stop heavy bleeding. Flight paramedics use aircraft to reach isolated patients. L-America favors helicopters for this purpose. In L-America, diamonds in Zambia are found only in alluvial deposits, not in primary sources. In T-America, someone with Earth Powers found a vein of diamonds suitable for mining. The poachers are caught, their gear should be confiscated (and used the benefit the rangers) and the rangers and medics should be hailed as heroes. Ellis' photos should be EXTREMELY powerful; some of the best-known photos ever taken happened under similar stresses. Let's say it wasn't an accident they wound up trussed like game. Hence specifying the location. The poachers aren't getting that jeep back, and if it's fixable, the rangers will have a silent camouflaged vehicle to ride around in. I love combat photographers. But then, I'm not the one who has to staple them back together. I really appreciate this story and I am looking forward to more in this setting and with these characters (hint, hint). > Why equations for a photographer? I actually looked up some examples of photographic equations to reference. Never had to, but agreed! Feel free to prompt for them in any open prompt call. Most people can learn to shoot decent pictures with intuition, some basic calculations, and a camera that does a lot of the work for them. Being able to do the real math, however, enables you to accomplish more and get shots that other people couldn't. It is one of the things which separates an amateur from an expert. I especially enjoy the final stanza.